As a child I was terribly impatient. In many ways I still am - knitting helps. My Nan always told me that I shouldn't wish time away as it goes quicker when you get older, and before you know it, it's all gone. Since having children I have certainly found my relationship with time is constantly changing - it's currently speeding up so much that my "baby girl" is a leggy five-year-old (going-on-fifteen) and I've been planning an eighth birthday party for the lad. Eight! How did that happen? I swear that the days have merged into a single high-speed blur since my own birthday last week. I had grand plans for those days, but seem to very little to show for their passing... except more laundry and taller weeds. Last night, in desperation, I cast on something new, using a cotton/linen yarn and I'll tell you about that tomorrow. For a while I've been meaning to write about Love at First Stitch - the new sewing book by Tilly Walnes from Tilly and the Buttons blog and the Great British Sewing Bee series 1. I was sent a review copy by the publishers before it was published and I wrote lots of notes about it in a notebook. My notes turned out to be quite tasty - Archie literally ate my homework. This a sore point as it isn't the only book he has ruined lately! Consequently, here is a delayed and slightly shortened version of my planned review. I have to tell you I have never been seriously inclined to sew my own clothes. As I've mentioned before, I've always drawn sketches and had my "tailoress" Nan or "sewing bee" Mum make them (if you missed the previous posts, my mum was on series 2 of GBSB). It's that whole dog and barking yourself thing. Despite this I was keen to read this book - I like Tilly's style and secretly hoped that Mum might make me some of the things in it. I wasn't disappointed, but I did get a little shock when it arrived - not only are the designs lovely (expected), but I actually feel that I could work my way through it and make them for myself - this was completely unexpected. 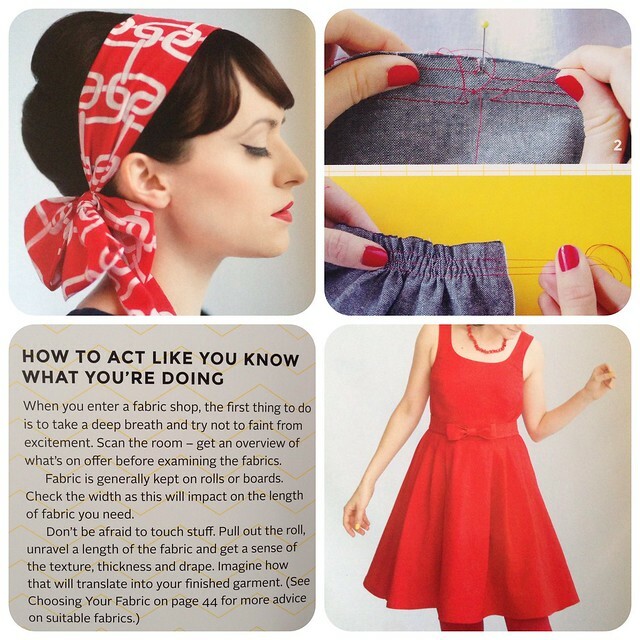 The book is marketed as a "refreshing approach to dressmaking" and I wholeheartedly agree. There is no jargon. 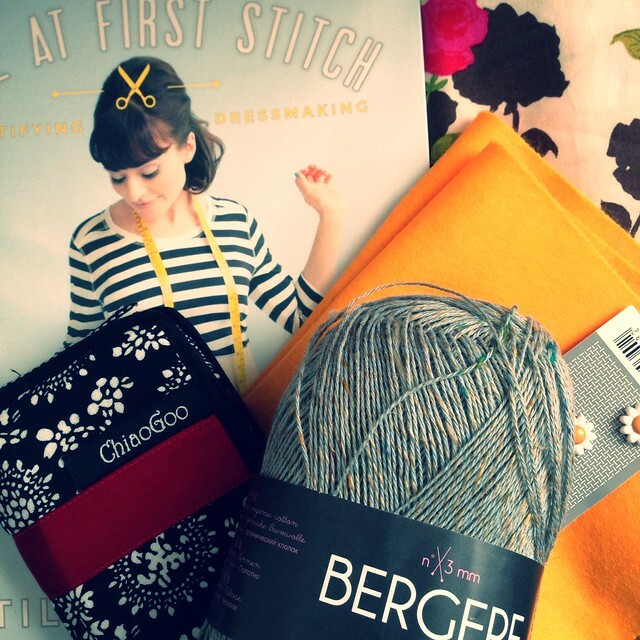 There are fun tips - like how to behave in a fabric shop! The techniques are explained in detail with step-by-step photos. Tilly says at the beginning that this is the dressmaking book she wishes had existed when she started sewing, and I can see why. It guides the beginner from the fundamentals of using a machine, to making a whole selection of key pieces for your 'handmade' wardrobe, as well as providing inspiration for customising the patterns to suit your style and body. As a "curvaceous" beginner I have found some of the other sewing books I have to be quite restrictive. Tilly has a whole section on pattern sizing, and how to custom fit the patterns by combining multiple size patterns - useful if, like me, you are not a standard size. This is another plus, 'shop sizing' which can be demotivating, isn't used! Instead there is a chart to work from for each pattern with eight different options for cutting out the patterns, based on the relevant measurements. The book is perfect for beginners to work through and patterns progress from a simple headscarf to a stylish dress (both pictured), with each section/design introducing new techniques and skills. I particularly like the customisation ideas alongside each design which encourage you to make the clothes your own. If you're experienced and you like Tilly's style you might want to buy it for the patterns anyway - it's clearly written, easy to follow beautifully photographed all of which makes for a book which is informative and really quite lovely. You can find Tilly on Facebook, Twitter, and on her fabulous blog. The book is available now! Thanks for sharing this Sarah. I've followed Tilly's blog for a while now. Mind you, I've had so much on my plate lately that I'm really behind on all my blog reading. Sounds like Tilly's book is as simple as the tutorials she shares online. I can see this going on my Amazon wishlist for birthday/Xmas. This sounds amazing. I've always wanted to sew my own clothes but I've failed whenever I've tried. And if it has tips about how to pick fabric in a fabric shop I'm definitely buying this. I have absolutely no idea. Hopefully it will work for Australian fabrics too. It took me ages to figure out australian yarn shops, we seem to make things more complicated.